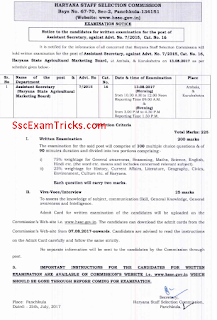 HSSC Municipal Secretary Call Letter 2017 HSSC Assistant Secretary (HSAMB ) Admit Card 2017 Exam Date Announced - HSSC Advt. 7/2016 Hall Ticket - www.hssc.gov.in. 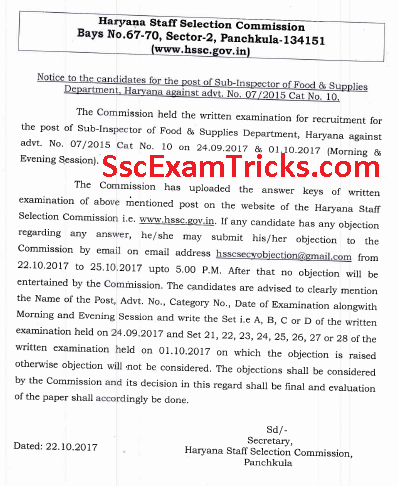 The good news is that HSSC Sub Inspector (Food & Supply) Answer Keys has been uploaded for both the exams date 24th September & 01st October 2017. The good news is that HSSC has uploaded Food Sub-Inspector Admit Card on official website. The SMS has been sent to the eligible candidates about the uploading of online admit card. The candidates can download their admit card from the link given here. 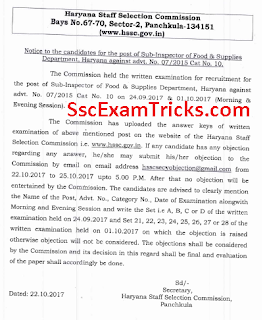 The good news is that HSSC has uploaded the exam schedule for Food & Supply Sub-Inspector under advt. no. 7/2015 cat no 10. The written test will be held on 24th September & 01st October 2017 in morning & evening session. The admit card will be available online from 19th to 23rd September 2017. Those candidates who have applied for these posts can download their online admit card from the link given here. 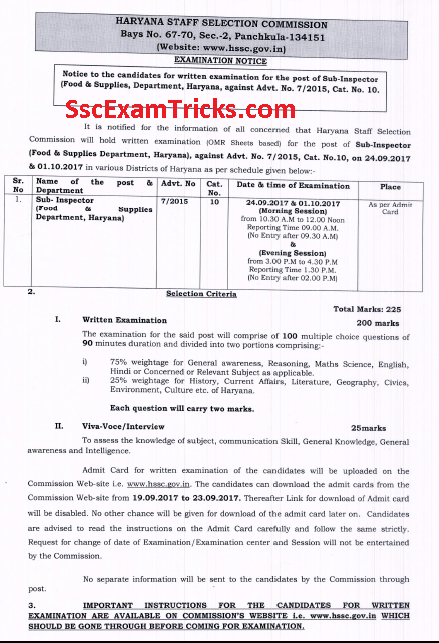 The good news is that Haryana HSSC/HSAMB has uploaded the exam date notice for Assistant Secretary under Advt. 7/2015 category no. 16 on official website www.hssc.gov.in. 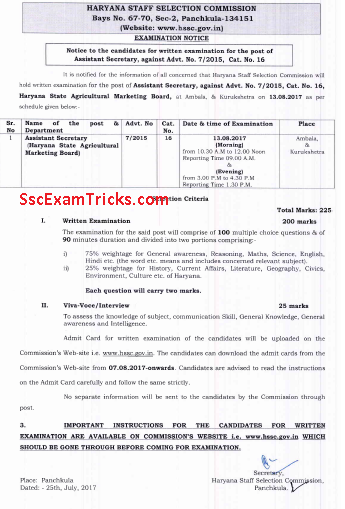 Haryana SSC had completed online applications for 331 vacancies of Clerk, Operators under advertisement 7/2015. The filling and submitting of online application form was organized from 16th January 2017 to 15th February 2017 on website www.hssc.gov.in. Huge numbers of candidates had applied for these posts. 1. Visit official website www.hssc.gov.in or click on the direct link given at this page. 2. Press ‘login’ button. Enter login ID and password. Click ‘sign in’ button. Click on the link given as ‘Download Admit card’. 3. 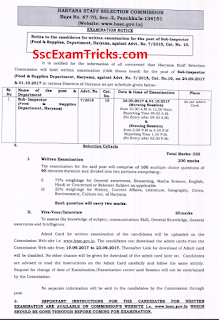 Take a printout /hard copy of HSSC Clerk Operator Admit Card/Result/ Merit 2017 for the written and interview exam.